You are running promotional programs? You want to leave something special among customers? Come with our Teddy Bear! Purchased for different purposes but they are really suitable for promotional gifts. 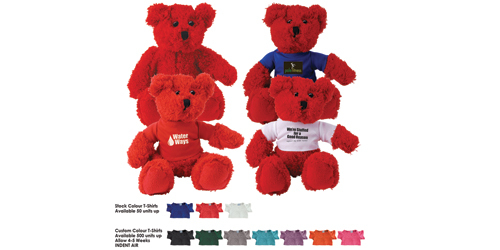 At WA PRINTING, we offer the chance to strengthen your business image by red plush sitting teddy bear with optional velco polyester T-Shirt, available in blue, red or white. Please feel free to contact us at provided addresses in Perth or the newly opened store in Midland. Let your customers remember your brand immediately when looking at this cute Teddy bear!